Returning to work after the Christmas break can often feel like a slog, but a new year also brings new objectives, new ideas and plenty of rejuvenated energy. This year the team will be managing the PR for a rapidly expanding drinks company (watch this space!) which prompted us to take a look at some of the most effective industry related campaigns. This month’s round up of wonderfully inventive PR campaigns includes creating the world’s first anti-ageing drink, hurtling a man into space, a community coffee competition and a clever marketing peg. Some PR stunts are deliberately designed to get picked up by journalists looking for a quick and easy ‘news’ story. When Warner Leisure Hotels teamed up with culinary creators Bompass & Parr to create the world’s first ‘anti-ageing gin’ the hotel giant knew it could guarantee a headline or two. 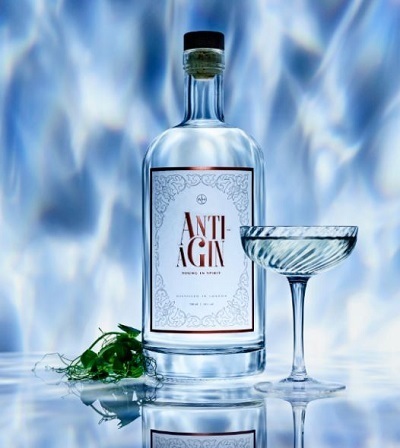 Dubbed ‘Anti-aGin’, the tipple’s ingredients include collagen and a variety of antioxidants and ‘skin-healing’ botanicals to help ‘reduce cellulite and sun damage’. Nicky Hambleton Jones, TV presenter from 10 Years Younger added extra kudos to the campaign by crediting the benefits of drinking edible collagen. In addition to stocking the gin at 13 Warner Leisure Hotels across the UK, it was also available to purchase online at drinksupermarket.co.uk – selling out in less than 24 hours! The clever concoction was covered in almost all of the national newspapers including The Daily Telegraph, The Metro and The Times. The gin was also featured on BBC Radio, GQ online, ITV.com, The Huffington Post and Mashable to name but a few. The creative campaign is a formidable example of a brand generating buzz from something outside of the realms of its core products offering. Starbucks’ Famous Pumpkin Spice Lattes are back – Better ‘Latte’ Than Never! Starbucks used over 24 million fans on Facebook to help usher in the Autumn holiday season to announce the return of its popular drink – the Pumpkin Spice Latte. 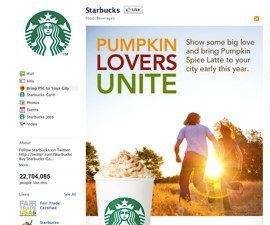 In 2011, the coffee chain unveiled a Pumpkin Spice Latte challenge on its Facebook Page. The beverage-branded Facebook game — a first for Starbucks — asked its users to compete to bring the Pumpkin Spice Latte to their cities a week before the drink's official release date. "One of the things that we know about the Pumpkin Spice Latte is that we have a huge fan base around this beverage that we bring back every year," says Alex Wheeler, vice president of global digital marketing for Starbucks. "We wanted to do something fun and different this year and empower customers to bring it to their city first." The Facebook application, included three different points-based activities. Beverage fans earned points for city shout-outs, solving a daily challenge or making a daily creation. A daily challenge might’ve asked a user to watch a video or answer trivia questions. A daily creation, for example, would have a user create and share a postcard for his or her city. One city put together a beauty contest which focused solely on orange clothes, accessories, make-up and hair treatments – what a sight! The city with the most passionate Pumpkin Spice Latte fans on Facebook in the U.S. and Canada was determined by points and got the beverage in their city a week early. The application featured an activity leader board, showcasing leading cities in real time. The Facebook contest ran from August 22nd to 26th and the Pumpkin Spice Latte was exclusively released to stores in the winning city – Chicago – for one week after August 30th. A great campaign grabbing the attention of real pumpkin spice latte fans in America, getting them involved to compete for their city to win! Red Bull has always done a great job at connecting with their audience through cool events and stunts. Back in 2012, it brought us one of the most memorable PR stunts in modern time: Red Bull Stratos. The stunt was collaboration between Red Bull and skydiver Felix Baumgartner and saw Felix ascend to 128,100 feet in a stratospheric balloon, followed by a free fall jump that was live streamed on Youtube. With this, Felix Baumgartner became the first human to break the sound barrier in free fall and helped provide valuable scientific data for space travel. Before the big event, behind the scenes footage of the preparations had been released to the public along with interviews with the team. This helped build a hype around the event, resulting in a whopping 8 million people watching the jump live on Youtube and coverage in mainstream outlets across the world. This campaign no doubt cost Red Bull millions, but must have provided immense value for the brand thanks to the incredible coverage that followed, all in line with the brand’s daredevil image. With a tagline like “Red Bull gives you wings”, what better way to reach your consumers than by throwing yourself into thin air? The world of iced coffee is an even bigger deal down under with leading brand, Farmers Union, outselling Coca Cola nearly 2:1 in South Australia – one of three brands globally to achieve this impressive feat of giant toppling. Farmers Union wanted to celebrate Father’s Day in a big way and what’s bigger than a brand’s name? Yep, the brazen brand changed its name to Fathers Union as part of its campaign to celebrate Father’s Day. The iced coffee brand also launched limited-edition packaging featuring four unique Father’s Day designs: No.1 Dad, Total Legend, Big Fella and The Boss. The campaign was accompanied by a series of ads featuring Adelaide radio host Dylan Lewis sharing advice to help dads enjoy the big day. The ads ran online and on radio supported by PR and outdoor advertising in the lead up to Father’s Day. Darryn Wallace, Marketing and Innovation Director at Lion Dairy & Drinks, the company which owns Farmers Union brand, said, “We have a proud following of local South Aussie men so what better way to honour some of them this Father’s Day, than with the limited edition Fathers Union Iced Coffee cartons." “Fathers Union Iced Coffee is launching exclusively in South Australia, the state in which the iconic drink was created back in 1977, to show our appreciation for, and celebrate, some of our most loyal fans who make Farmers Union Iced Coffee the icon it is today." A fabulous, feel-good campaign – not only eye-catching and fun but also a great way to boost sales and talk to the Farmers Union fan base. The campaign achieved coverage in regional and trade media.